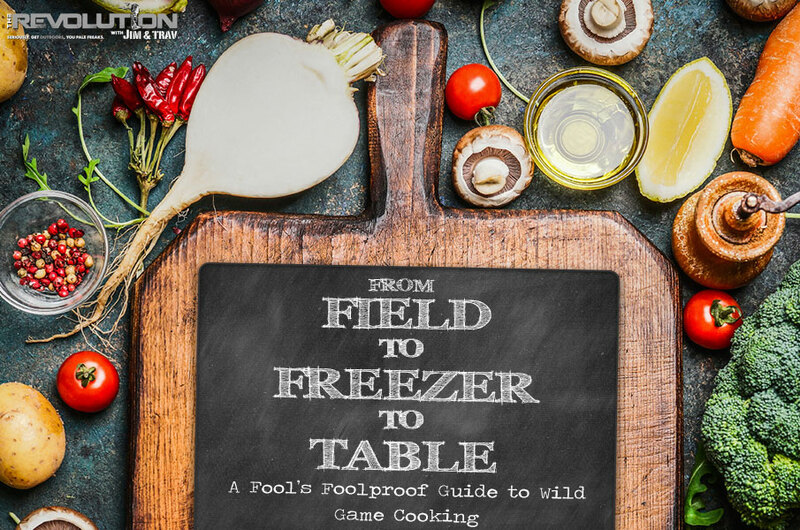 The Revolution with Jim and Trav presented by Outdoor Channel, we've prepared "A Fool’s Foolproof Guide to Wild Game Cooking" with the necessary steps it takes to get your kill from field to freezer and, ultimately, to your table. Joining this scrumptious dialogue will be none other than Scott Leysath host of "The Sporting Chef" seen on Sportsman Channel, Drury Outdoors' General Manager Matt Drury, Hans Hummel the President and CEO of Hi Mountain Seasonings, Ryan Neeley the Marketing Manager for Camp Chef and The Revolution's Predator Pulse with two time World Champion Geoff Nemnich. Tune in this week and learn how to turn a freezer full of wild game into gourmet meals. Scott Leysath is the host of "The Sporting Chef" seen on Sportsman Channel on Sundays at 12:30 pm ET. Scott will cut straight to the chase and won't mince words about his lack of tolerance for overcooked game. He'll also dish a fabulous tip for using up wild game odds and ends to make a savory stew that's fit for a king. And if you've ever wondered what pairs best with bear or javelina, you'll have to tune in to find out. Drury Outdoors' General Manager Matt Drury will share his perspective on why wild game is the most authentic, sustainable, grass fed meat. He'll speak candidly about the core values his family stands for and why hunting is intrinsic to all. And finally, Matt will lay the ground work for venison chili and spaghetti, and why it's such a fan favorite. Hi Mountain Seasonings: Hans Hummel, Hi Mountain Seasonings' President and CEO, kicks our tastebuds into overdrive when he serves up the nitty gritty on their all-new Spicy Lime Blend Jerky Kit, plus their Chardonnay, Merlot, Pinot Gris and Pinot Noir Finishing Sauces. And to top it off, Hi Mountain Seasonings has even come out with a third Jerky Kit Variety Pack that features the Spicy Lime, Hunter's Blend, Jalapeño, Bourbon Barbecue and Original Seasoning to commemorate 25 years of business. Camp Chef: Bringing us the latest trends in "back country to back patio" will be Ryan Neeley, the Marketing Manager for Camp Chef. He's got all the specs and anything tech and he'll certainly ignite your passion for smoking when he explains the versatility of their SmokePro line of Pellet Grills and the power of their tried and true Smoke Vaults. Camp Chef is certainly at the forefront of style, class, functionality and innovation, when it comes to any backyard grill, pellet smoker, lightweight portable stove and any cooking system that's designed for the avid outdoor cooking enthusiast.